Domes are ubiquitous throughout industrial, military, architectural and commercial applications for one reason primarily: strength. The Roman Pantheon Dome is 43 meters in diameter and is still standing strong after almost 2000 years. Glass is actually an ideal material for domes because of its strength, optical clarity and aesthetic value. Rayotek glass is superior to other readily available materials due to its compressive strength and, with the right choice of glass, for its wear and scratch resistance. For isostatic force conditions, such as deep sea, glass is superior to steel, ceramics and even sapphire. Given the optical clarity of glass it is the go-to material for Optical Camera Domes, Aerospace Domes and Deep Sea and Marine Domes plus any other applications that require the marriage of clarity and strength. WHY AREN'T LARGE GLASS DOMES USED IN MORE APPLICATIONS? 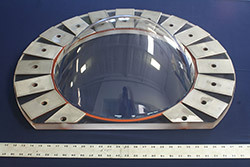 Even though glass domes are very common for a myriad of applications, they are traditionally only available up to a relatively small size, approximately 430mm (17"). This is due to the lack of equipment large enough to process and handle larger domes and a lack of expertise in the industries that supply glass domes. 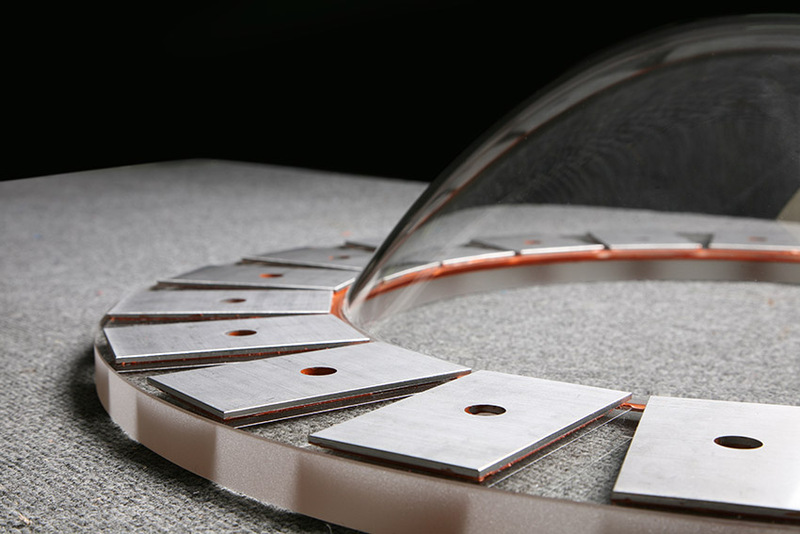 For these reasons Rayotek designs and engineers its own equipment, utilizing over 25 years of unique experience in the fabrication of large glass domes and optics. WHAT DOES IT TAKE TO FABRICATE LARGE DOMES? 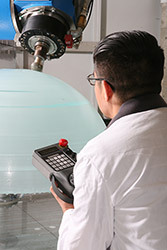 The processes required to fabricate large glass domes are similar to techniques for fabricating large telescope optics, but more complex because the hemispherical shape makes safe handling very challenging. For example, placing a dome, opening down, on a flat surface then trying to pick it up by hand without it slipping is highly challenging. Imagine trying to do this with a 3000-pound dome with polished surfaces and $100,000+ in material costs! Raw materials - glass materials are readily available off-the-shelf for fabricating small domes; this is not the case for large domes. For a large glass dome a large glass blank must first be created by fusing smaller pieces of glass together. 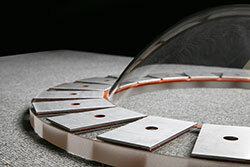 This fusing process must be performed in such a manner as to limit bulk distortion, bubbles and other inclusions. It takes years of research and experience to fabricate high optical-quality fused glass. Handling Equipment - as noted above, large domes can be very heavy and involve high materials costs. One mistake during handling, creating even a small chip, will likely render the entire dome a loss. Sophisticated equipment such as: vacuum grabbers, hydraulics, precision control lifters, flippers and load cells are required to handle large domes gently. In addition, ongoing engineering expertise is necessary to design new handling equipment because every job has its own unique handing requirements. Thermally Controlled Work Environment - all materials, including glass, change shape with changes in temperature. The larger the dome, the more susceptible it is to variations in the temperature of the processing environment. 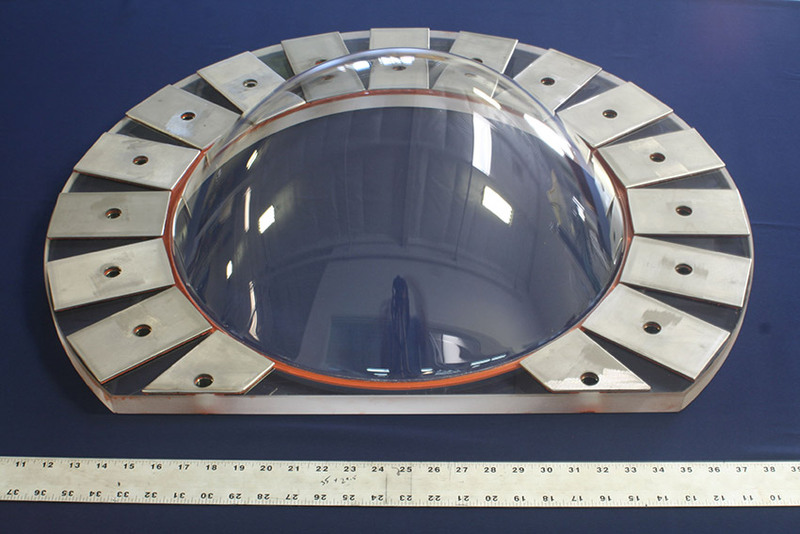 To fabricate a large precision optical dome the temperature variations should be kept less than +/-2°C at all times. 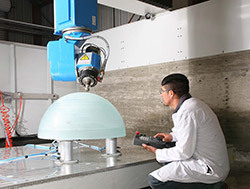 Large One-Off Equipment - fabricating a large dome requires equipment massive enough to precisely grind the dome into a shape without vibrating or flexing. This means even the foundation holding the equipment must be specially designed with extra reinforcement. For example, Rayotek's massive 5-Axis Diamond Grinder is mounted to a 16" thick double reinforced, vibration controlled concrete slab in a temperature-controlled building. To insure a very flat dome edge, a rotary lapping machine must have a wheel massive enough to not flex. 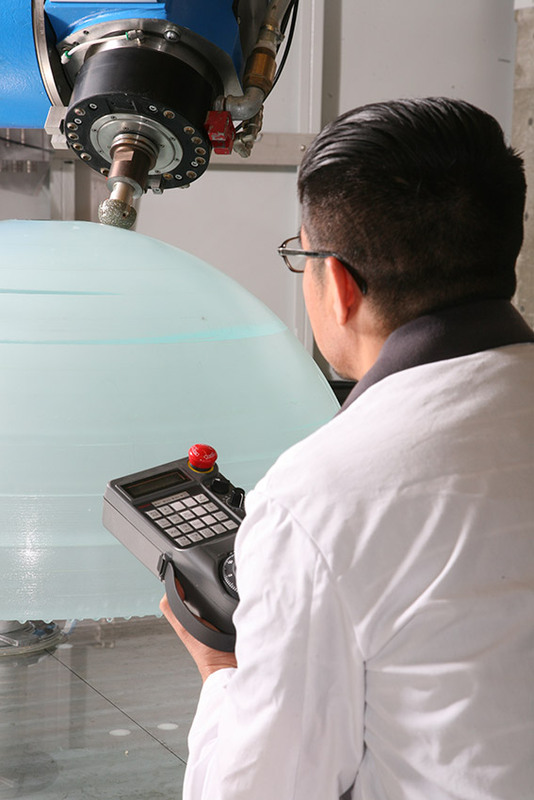 Inspection and Certification Capabilities - just like their smaller counterparts, large glass domes must be inspected to determine if they meet dimensional, profile, optical and surface requirements. Ideally this is done at the site of the shaping process so as to avoid extra handling. After inspection the domes must be certified, and verifiable documentation created, by calibrated inspection equipment to insure conformance to specifications. Expertise - materials, equipment and environment alone do not guarantee fabrication of a successful dome. The proper professional staff, including at least one in-house engineer and a master optician, will ensure the best use of the assets above and the most successful dome production. Rayotek employs 8 engineers plus a Master Optician with 40 years of experience in massive optics. To learn more about fabricating large glass domes contact us to speak with one of our specialists. We look forward to using our vast knowledge to co-create with you. This is how we become better engineers, and a better vendor to you.